Winners announced in Celebrate Literacy Week, Florida! public service announcement contest -Tallahassee, Fla., January 17, 2013 - The Florida Department of Education is recognizing the winners of the 5th annual Celebrate Literacy Week, Florida! statewide public service announcement (PSA) contest. The goal of Celebrate Literacy Week, Florida! is to promote literacy throughout the state by raising awareness of the programs and projects offered by the Department of Education and its partner agencies and organizations. For more information about other Celebrate Literacy Week, Florida! events, visit Just Read, Florida! 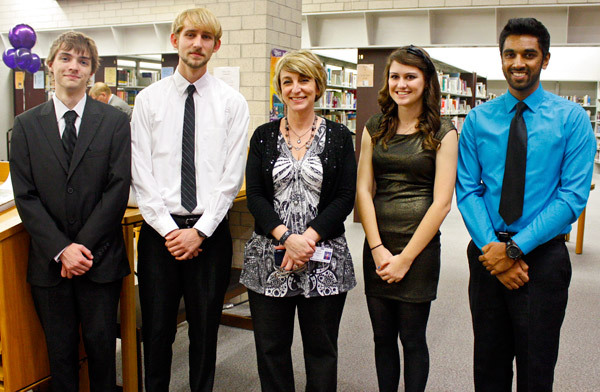 On Tuesday, January 15th an induction ceremony was held for the inaugural members of the first National Technical Honor Society (NTHS) at River Ridge. NTHS (www.NTHS.org) is the acknowledged leader in the recognition of outstanding student achievement in career and technical education. Thousands of schools and colleges are affiliated with the Society. Member schools agree that NTHS encourages higher scholastic achievement, cultivates a desire for personal excellence, and helps top students find success in today’s highly competitive workplace. The requirements for membership are that the student must be part of a CTE program/course (includes ROTC) and maintain a 3.0 WGPA. Interested students should see Mr. Hoffmann in room 3-115 for applications and information. Story courtesy of Mike Carlson. Pictured below with Mrs. Swanson are the officers, from left: Brandon Ramos, President; Stephen DeVinney, Vice-President; Hannah Chasney; Secretary and Amar Patel, Treasurer. Our spotlight for January is on Tracey Gillies of Gulf Highlands Elementary School, for her "Faux Flipped Classroom" model. In the video below, Tracy explains how she uses video technology and online learning to "flip" her math classroom and increase student achievement in the process. Tracey records her videos using an iPad and two great pieces of free software - ShowMe Interactive Whiteboard, by Learnbat, Inc, and Educreations Interactive Whiteboard. Once she's done making a video, she adds a link to the video into her Moodle class, along with links to other related videos and a comprehension quiz. She also uses centers, summarizers, math games, and small group meetings. Although each video can take 10 to 15 minutes to record, the videos can be reused each time the unit is taught. Tracey tells us her Principal, Kara Smucker, has been extremely supportive and helpful. She also reports that parents love being able to watch the videos to better help their children, and students enjoy being able to watch the videos more than once if they are confused. One way to extend this concept is to have students make their own videos. If you're looking for an example of how this might be done, check out mathtrain.tv, which is a website run by middle school teacher Eric Marcos. Mr. Marcos has had a lot of success with having students create math videos on a wide variety of topics. For more information on Blended Learning, check out The Innosight Institute's Blended Learning page. TJ Pyche is a well rounded, goal oriented individual with exemplary character and leadership skills. He is not only a successful student academically, carrying a 4.67 GPA and a composite ACT score of 33, he has also distinguished himself as an example of student involvement in his school and community. As you can see from the information TJ has provided, he belongs to numerous organizations, both in and outside of school, several of which he serves in leadership roles working hard to better the organization and the individuals within them. Even with all of these time commitments he manages to find time to tutor underclassmen, volunteer for several organizations, hold a part time job and intern at an attorney’s office. TJ has challenged himself throughout high school with a rigorous academic program of study by taking advantage of both advanced placement and dual enrollment courses. He leads by example and has earned the respect of his peers, teachers and administrators by being a self starter, reliable and able to follow through on his commitments. TJ is a positive role model in all areas of his involvement at Pasco High School and our community. Students, teachers and administrators have benefited from his positive outlook, exemplary character, and his commitment to succeed. It is without any hesitation that I recommend Thomas (TJ) Pyche for consideration as a Lombardi and Stamps Scholars recipient. He is an altruistic young man with the work ethic, commitment, character, and leadership skills worthy of being awarded this scholarship. Pasco County Schools has at least one career academy at each of its thirteen high schools. Gulf High School's career academy is the Academy of Health. Gulf High School teacher Phyllis Butler and her students love the Academy of Health. It is wonderful when you meet students and teachers who love what they do. Here is a video that tells their story.